"It seems disgraceful to me that a person such as Williams now is to be given the keys to the city. We talk about juvenile delinquency, and fight against it, and then officially honor a man whom we should officially horsewhip for the vicious influence he has had on childhood in America." Colonel Dave Egan, Boston Record, April 30, 1952, on the day the Red Sox honored Ted Williams before he left for service in the Korean War. The myth and legend of Ted Williams cannot compare to the real Ted Williams. No other athlete who has ever played in Boston, including Babe Ruth, has seen his life dissected so much by biographers as Williams. There are several excellent books available that detail Williams' exploits on and off the field. Ben Bradlee Jr's "The Kid -The Immortal Life of Ted Williams" stands above them all. In terms of depth, detail and storytelling attributes, it's a worthy read. The book's 831 pages offer the definitive biography of one Theodore S. Williams. Ted's successes and faults as a man, father, husband and teammate are laid bare. His incredible ability to hit the ball, his transformative work ethic, his skills as an angler and Marine Corps [pronounced 'core'] pilot are regaled. His often-volcanic irascibility is present throughout, as are stories about his amazing and unpublicized generosity. His Mexican ancestry puts Williams atop the list of "Best Hispanic Ballplayers of All-Time," or a close second behind Roberto Clemente. Today, on Veterans Day, it is Williams' service in Korea that gives us the single most impressive and untouchable record in Boston sports history. That would be 39 ground-attack combat missions flown during the Korean War as a U.S. Marine Corps pilot in his F9F Grumman Panther. Thirty-nine times he took off from his base. Thirty-nine times he and his squadron mates risked life, death and capture at the hands of the Chinese and/or North Koreans. Thirty-nine times he returned safely, not always fully intact. Williams flew his first combat mission on Feb 16, 1953, deep into North Korean territory. Capt. Williams dropped his plane's bombs as planned. But his plane was hit by small arms fire, had a fuel leak and was without a working radio. Williams was so disoriented after the attack, others in his squadron had to lead him back to his base. He refused to eject, fearing that his back would be broken and/or knees would be shattered due to his 6-foot-4 frame. Instead, without its landing gear deployed, Williams crash-landed his plane, suffering only a sprained ankle. And perhaps some slightly-damaged pride. In a letter to then-girlfriend Evelyn Turner - yes, the Splendid Splinter was still married at the time - Williams wrote: "I had holes all over the plane and was riding on all the prayers people say for me 'cause I was awfully lucky. My plane was burning like hell when I crash landed. Everyone around here is now calling me lucky." Williams had less than 24 hours to [figuratively] lick his wounds. He was airborne the next day, dropping four bombs on another target outside Pyongyang. He would complete 37 more missions, flying several with John Glenn . Yes, that's the same John Glenn who had "the right stuff" as one of the seven original Mercury astronauts. Williams' final tour of duty with the Marines ended in June of 1953, after he developed a serious illness. One of Williams' other war buddies was fellow Marine pilot, long-time Yankees second-baseman and broadcaster Jerry Coleman. Coleman was the only professional baseball player who saw combat in both World War II [then as a bomber pilot] and the Korean War. Williams didn't want to return to the Marines in 1952. He had initially contested being drafted in World War II, as well. He relented in 1942 when skipping this fight was no longer a publicly-palatable option. Cleveland Indians Hall of Famer Bob Feller, on the other hand, was the first pro athlete to enlist, signing up for the Navy two days after the Japanese attack on Pearl Harbor. Feller would serve aboard the USS Alabama until the end of the war. Williams wasn't forward deployed to the Pacific until mid-1945, days before World War II ended. His commanding officers wanted him to remain state-side to play baseball for their various teams. Come Korea, Williams and many others being recalled were justifiably upset. They had fulfilled their commitment to military service. Or so they thought. The military was surprisingly short on pilots with real combat experience when the Korean War began in 1950. There had been immense downsizing after World War II. Williams had remained in the Marine Corps reserve, but had what he and others considered a gentleman's agreement that he could not be re-called to active duty. Thanks to a change in the law signed by President Harry Truman, Williams was eligible for active military service. As things bogged down in Korea, he was one of thousands called back. He tried every legal avenue available to earn a deferment. He also reached out to political connections. He was the sole supporter of his mother and brother at the time, not to mention his wife and daughter. When Williams' various ploys and pleas to escape military service in Korea failed, despite having served three years in World War II, he reluctantly agreed to report for duty. The fact that the Red Sox agreed to pay him his full 1952 salary of $85,000 wiped out those legitimate financial concerns. "He was pissed off to no end that he had to go back a second time," ex-Red Sox infielder Ted Lepcio said in Bradlee's book. Williams kept his feelings hidden from the public until an infamous interview in 1957. It was the sort of outburst for which he would soon apologize, at the insistence of Tom Yawkey. Williams' resentment toward his conscription into the Korean War was no secret around Fenway Park. "Ted felt Truman had [a vendetta] against professional ballplayers," former Red Sox clubhouse attendant John Murphy said in Bradlee's book. "Ted had a deep-seated hatred for the government for f--king up his career. 'They didn't know what they were doing. Nobody told us about the antiaircraft fire in some f--kin' valley. The reconnaissance was pathetic. They were putting lives at risk unnecessarily. They never warned us.' [He would say.] These were angry, derisive outbursts, but terribly funny, too." Naturally, Williams homered in his final at-bat at Fenway Park before heading for Korea, giving the Red Sox a 5-3 victory over Detroit on April 30, 1952. Williams' combat experience in Korea, and the years he spent as flight student, pilot and instructor for the Marines and Navy in World War II, mainly in Pensacola, Fla., served him well later in life. When the Red Sox team plane was struck by lightning in the late 1950s, Williams was the only passenger who kept his cool. "They had a cracked window and the priest was up saving everyone," former Red Sox utility outfielder Marty Keough told Bradlee. "Ted was the calmest of anyone. He didn't say a word, just sat there. Everyone else was freaking out, especially the one who didn't like flying in the first place. He was probably thinking, 'S-it, this is nothing. Just imagine doing this every day in Korea.'" As he softened in his later years, Williams embraced his service in the Marine Corps and in the Korean War. He was hardly the only Bay Stater who fought in or around Korea. My dad served in the Air Force from 1950-54 and spent the bulk his service time just across the Sea of Japan working on B-36s and F-86s. "Korea" was never a "forgotten war" in my house. Without his service in the Navy and Marines, and his notable combat experience in Korea, Williams would have been just another "Greatest Hitter Who Ever Lived." Not to mention "Greatest Fisherman Who Ever Lived." His military service rounded out his larger-than-life narrative. Williams ended his career with 521 home runs, a .344 career average, 1,839 RBI. He remains the last major-leaguer to hit above .400. The statisticians tell us that Williams, who was obsessed with personal achievements, would have compiled a .342 career average, 3,452 hits, 2,380 RBI and 663 home runs had he played without war-time interruption. Williams bemoaned his loss of MLB service because of his time in Korea. He died at peace when it came that area of his life, however. Frozen or not, Williams remains the "Last Real American Hero" as far as millions of New Englanders and Boston sports fans are concerned. The "John Wayne" comparisons, while apt, never did Williams true justice. Wayne, after all, was an actor born with the name Marion Morrison. Williams' exploits and successes were all too real, and remain as untouchable now for any ballplayer in 2014 as they did in 1941 across the stadiums of the American League, or in 1953 in the skies above the Korean peninsula. He is best remembered for the numbers 9, .344, .406 and 521. But it was that 39-0 record that truly transformed Williams into an all-time, iconic real American legend. You don't get a tunnel named in your honor for just playing baseball. 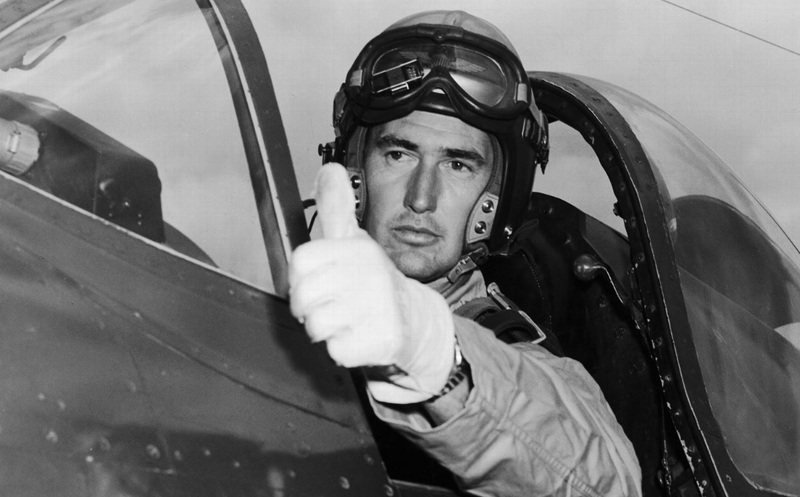 "There was no one more dedicated to this country and more proud to serve his country than Ted Williams,'' Glenn said after Williams' death in 2002. "He may have [hit] .406 for the Red Sox, but he batted 1.000 as a United States Marine." No World Series rings were necessary.